ATMs are available 24/7 for account withdrawals and balance inquiries. HCCU is a member of the Members ATM Alliance (MAA). You may use any MAA ATM surcharge free. 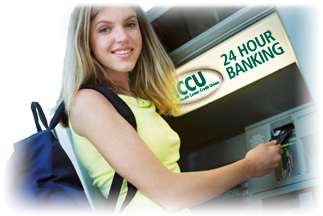 Use of any ATM outside of the HCCU / MAA ATM network will incur a $1.00 Foreign ATM fee. There is a daily ATM deposit limit of $1,500 (combined amount of cash and checks), and a daily withdrawal limit of $500 (cash). Proprietary ATMs – Funds from deposits (cash or checks or drafts) made at an ATM that we own or operate will be available by the second business day after the date of your deposit. However, the first $200 of the deposit and funds from U.S. Treasury checks that are deposited to the account of the named payee will be available on the first business day following the day we receive your deposit. All ATMs that we own or operate are identified as our machines. Non-Proprietary ATMs – Funds from any deposits (cash or checks or drafts) made at an ATM that we do not own or operate will not be available until the fifth business day after the date of your deposit.